Georgia’s MBA programs are changing with the times. One size doesn’t fit all when it comes to programs offering a master’s degree in business administration. Schools have long been tailoring their courses to fit the particular needs of their students and the state’s business community. But the sustained economic downturn has brought some lessons of its own. Ogbuehi cites the continuing need to teach analytical skills, helping students understand the ripple effect of complex decision-making; asking, for example, how a marketing problem might affect other divisions within a company. “We are refocusing our capstone course, which is our business policy class, to make sure our MBA students understand how to make decisions in truly complex environments,” Ogbuehi says. Statistics support the value of MBA programs. Hiring projections are up for newly minted MBAs, according to the 2011 Year-End Poll of Employers Participant Report compiled by the Graduate Management Admission Coun-cil®, a nonprofit organization of graduate business schools providing research and information about graduate level management education. Seventy-four percent of companies surveyed plan to hire MBAs, up from 58 percent in 2010. Other findings show that 32 percent of those companies intend to raise annual base salaries for new MBA hires and that paid internships are also on the rise. This is good news for the more than 3,500 MBA candidates currently enrolled in programs in the University System of Georgia (USG) alone. Sixteen state universities from every region of Georgia have MBA programs, most accredited through the Associa-tion to Advance Collegiate Schools of Business (AACSB). Enrollments range from 1,044 students at Georgia State University (GSU) located in downtown Atlanta, with satellite campuses in Alpharetta, Buckhead, Brookhaven and Henry County, to 28 MBA candidates at North Georgia College and State University in Dahlonega. Georgia is home to some of the top-ranked MBA programs in the world. In October 2011, the Full-Time MBA at Emory University’s Goizueta Business School was ranked 19th among schools in the United States and 28th among the top 100 international programs by The Economist. The program was ranked 18th among U.S. schools by The Financial Times; 5th by Bloomberg BusinessWeek and 19th by U.S. News & World Report. The Executive MBA program offered by the University of Georgia’s Terry College of Business is ranked 22nd in the world and 18th in the U.S. by Bloomberg BusinessWeek. Though most MBA programs offer a general business management degree, some offer concentrations within their program. Georgia State offers 13 concentrations, from information systems to international business. In 2011, Clayton State introduced concentrations in accounting and international business, but the school’s niche is a concentration in the booming supply chain field. Developing distinctive programs is essential in the crowded MBA marketplace. The challenge isn’t just creating content, but determining how to teach it. There are full-time, part-time, flexible, professional, executive and international MBA programs. For a general MBA, the most popular part-time programs can take anywhere from two to five years to complete. Costs vary significantly from program to program, school to school. Take the four MBA programs at the J. Mack Robinson College of Business at GSU as a case in point. As one of the oldest MBA programs in the nation, starting in 1958, GSU knows what it’s doing and has the accolades to prove it. Both the Professional and Flexible MBA programs are ranked as No. 1 part-time MBA programs in Georgia by Bloomberg BusinessWeek, and each is ranked in the top 10 percent by U.S. News & World Report for 2011. The Executive MBA program requires a minimum seven years of work experience, costs $65,000 and is completed in 17 months. The Global Partners MBA is a full-time program requiring candidates to live overseas for part of the 14-month program. It costs $67,000. The Professional, Executive and Global Partners programs are cohort-based; students follow specific courses with the same cohort, or group of students. Professional and Flexible (Flex) MBA are part-time programs tapping into the working professional market but attracting very different types of students. The Professional MBA can be completed in 24 months and is offered at satellite locations in the Atlanta suburbs. It costs roughly $44,000 with a minimum four-year work requirement prior to enrollment. Approximately 500 students each semester enroll in GSU’s popular Flex MBA. It requires a year of work experience, candidates can take up to five years to complete it and it’s a bargain at around $36,000. “The Flex MBA is a great return on investment,” says Toby Mc-Chesney, assistant dean of graduate recruiting and student services for GSU’s Robinson College of Business. “It gives you the flexibility to take one class a semester if work is really busy. If you want to speed it up, you can take up to five classes a semester. That’s the beauty of the program.” Most classes are held downtown, but some are available at the Al-pharetta and Brookhaven campuses. The average age for Flex MBA students is around 28, somewhat younger than in the past. Mark Edwards is typical of students in the program. He graduated in 2007 from GSU with an undergraduate degree in economics, moving directly into a job as a bank manager, where he worked for two years. “I didn’t want to do banking for a living, but didn’t have a definable marketable skill,” he says. “Getting an MBA was the next, most logical step in order to market myself. I needed something to set myself apart.” Edwards changed jobs, moving to a company supportive of his desire to earn an MBA; it even helps foot the bill, although he’s also taken on student loans. He’s looking at a concentration in finance and operations management and would like to go into consulting to build his résumé before settling in with a company in one of those two fields. 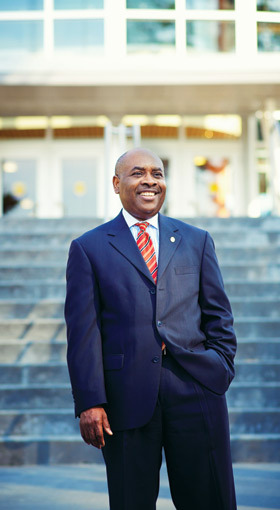 Despite his undergraduate experience there, selecting GSU’s MBA program wasn’t a slam-dunk. It wasn’t just finances that ultimately tipped the scales. “GSU’s power ranking was a huge draw over the other schools,” he says. Edwards also took advantage of student services available at the Career Management Center. “They’ve done a good job, starting early, with reaching out to students and making sure they have what they need,” he says. “I sat down with one of the career counselors and did my initial assessment, taking interest tests, helping me define what I was looking for after I get my degree.” Though many Flex students don’t have the time or inclination, Edwards is involved with the Graduate Business Association, a student organization offering events, such as a speaker series, geared toward graduate students in MBA and other master’s programs in the business college. Programs at other universities often offer the same types of services as those available at GSU, though on a smaller scale. And some, like the University of West Georgia (UWG) located in Carrollton, offer something GSU does not – access to an online MBA program, part of the AACSB-accredited Georgia WebMBA® program. In addition to West Georgia, the Georgia WebMBA is offered by five other University System schools: Col-umbus State University, Georgia Col-lege (formerly Georgia College & State University), Georgia Southern Univer-sity, Kennesaw State University and Valdosta State University. Other than the locale, everything about the WebMBA is the same; students register at their individual schools and are taught by the same full-time graduate faculty as their on-campus peers. It is a five-semester program, and at $20,100 total, the cost is tough to beat. For students looking for a more traditional MBA experience, West Georgia offers its program at three campuses: Carrollton, Newnan or Douglasville. This summer, the program will embark on its first venture overseas. “We’re giving grad students the opportunity to go to Tours, France, for two weeks of study abroad,” says Turner. “We have a sister school, ESCEM; they’re a consortium by the French government with an English-speaking campus.” Students will spend two weeks at ESCEM doing a business management course, and next summer (2013) French students will come to Carrollton for studies. Private colleges and universities add subtle differences to the mix of MBA programs. Reinhardt University in Waleska has offered an MBA program for the past five years. “We know we’re not competing with Goizueta,” says Dr. John Yelvington, assistant professor of economics and program director for the Reinhardt Advantage MBA program. “We’ve got a niche market.” Students are drawn to Reinhardt’s MBA because of cost, a modest $17,000, small classes that meet once a week, experienced faculty and the Practicum, a component of the course giving candidates an opportunity to learn business while developing a business. At Berry College in Rome, Dr. John Grout, dean of the Campbell School of Business, paints a similar picture. The size of the MBA program is quite small, just 27 students currently, though there have been as many as 60. But the level of instructor/student interaction is a major selling point, as is the location for professionals in the region looking to earn an affordable, accredited MBA. To the question of relevance: Jade Tate took 10 years to earn her undergraduate degree in English from Clayton State. A working mom and owner of a convenience store in downtown Atlanta, Tate took classes, sometimes just one a semester, until she graduated in 2010 and came to this conclusion: “Whether I wanted to expand my business or work for a corporation, I needed to keep myself marketable,” she says. She immediately began the MBA program at CSU, taking classes at the Peachtree City campus. This time, she finished much more quickly; she’ll earn her Supply Chain MBA in May 2012.